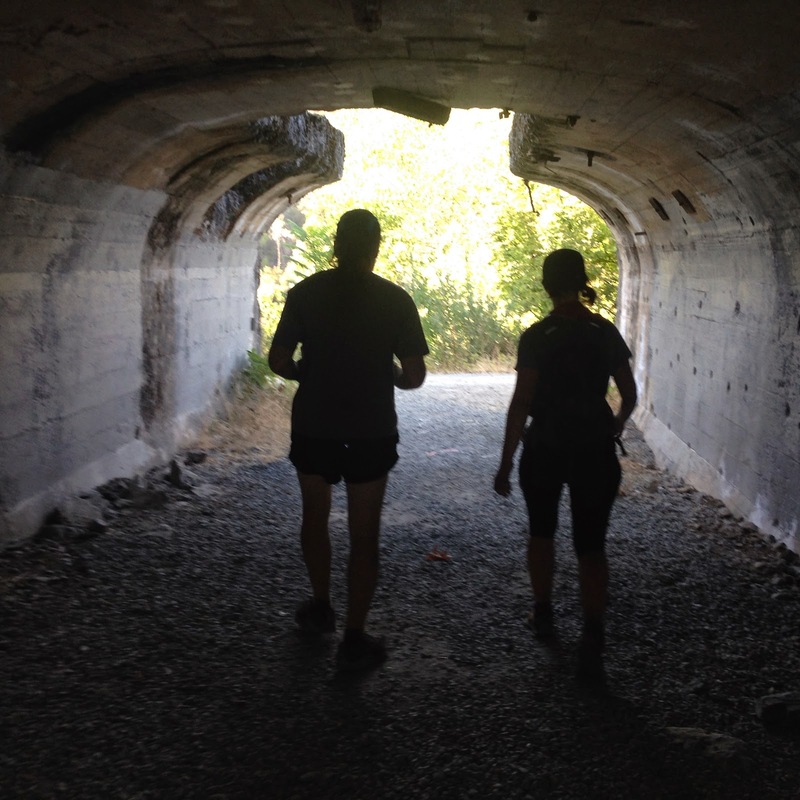 As our love of trail running grows, so has our interest in its people, history and events. Which is why Ann & I now anticipate and eagerly follow the Western States 100-- the world's oldest and most famous one hundred mile race. We are, however, under no delusions that we will ever run it. Not only is that distance too far, it's a lottery to get in and the odds are not good. After all we've seen, heard and read about the race, though, we thought it would be fun to run on part of the course. 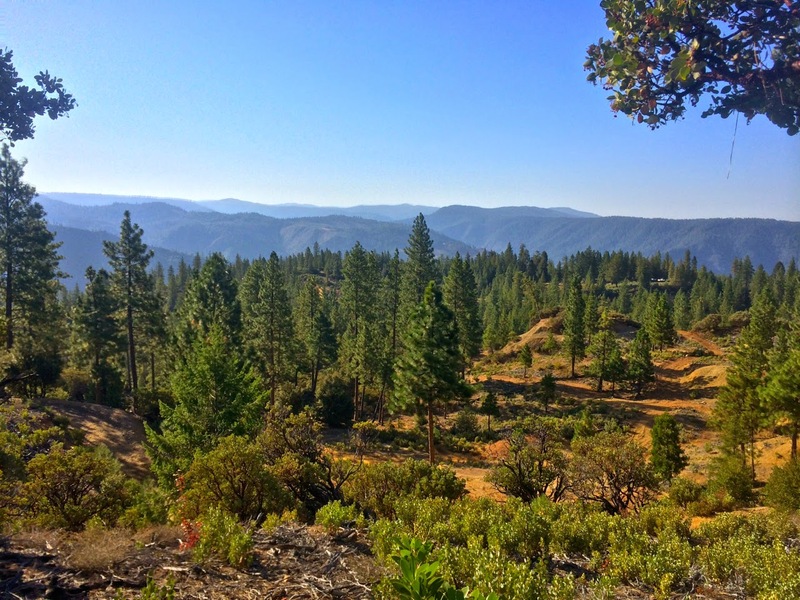 Which is why, when I read an article about the legendary Ann Trason's return to running and her inaugural 100k/50mi/50k event on the Western States Trail, I knew we had to run it. We registered for the 50 mile race, nervous about the 13,000 ft of elevation gain but happy to see that it was all under 3,000ft altitude-- high altitude is part of what made our Three Sisters run difficult. Some of the complications of preparing for a race we had to travel to were alleviated by the fact that Ann & her husband, John, drove. They brought food and gear; everything to make the the night before, the race itself, and recovery afterward pleasant. My family flew into Oakland on Thursday, where my husband and 3 year-old stayed all weekend to be entertained by friends and plentiful playgrounds. They dropped me off at the airport car rental place around 4:30pm, and suddenly I was alone. 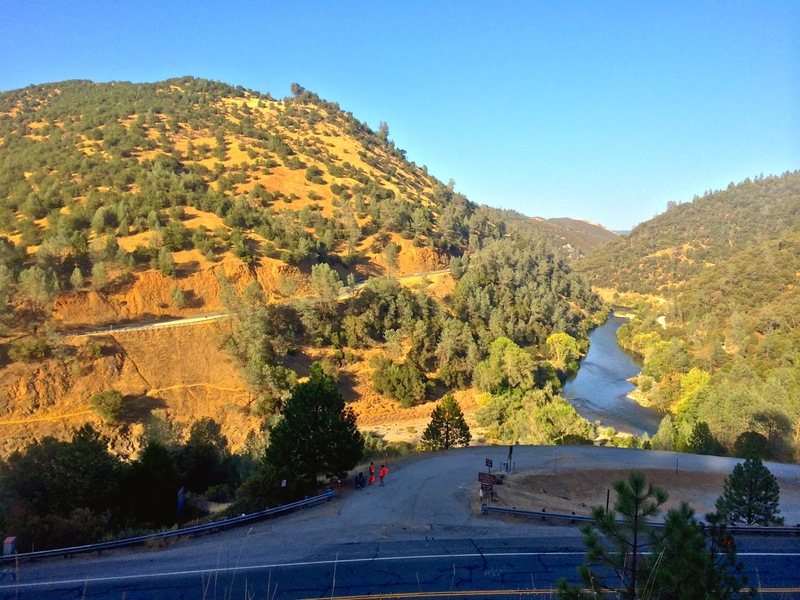 Traffic headed east on highway 80 from Oakland was abysmal. What should've been a two hour drive took three. Most of that was getting out of the Bay Area, but the traffic jams extended a surprisingly long way. Instead of going to my hotel in Auburn, I headed straight to the house where Ann & John were staying. It was almost 8:30 by the time I got there, which is when I had originally hoped to go to bed. Ann & John had prepared a delicious meal of salad, pasta, tomato sauce and veggie meatballs. I couldn't eat much-- nerves or maybe the half a sandwich I finished while stuck in Oakland traffic. Ann & I hashed out what gear we were going to wear, carry, and put in a drop bag for the Rucky Chucky aid station at mile 35. We also made final plans for getting to the starting line-- I would drive from my hotel to the finish and take the shuttle to the start, while John would drive Ann to the start with some extra gear. We bid goodnight and I breathed deeply in the dark, day-baked air under the high blanket of dancing stars. I am rarely alone these days, and I now felt it distinctly. I had a car and a credit card, and I could go anywhere, anywhere at all. But I knew I would drive back to Auburn, check in at the hotel, banter with the clerk (who was pretty cheerful for a kid working at 9:30pm on a Friday night). 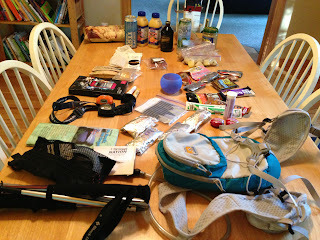 I knew I would carefully organize my toiletries for the morning, my necessary gear for the run itself, and my comfort items for after the race. And that's just what I did. Of course it took forever to fall asleep, and I woke up many times, and I awoke for good even before my 4am alarm. I took my time, deliberate in getting ready, and was out the door right at 4:30am as planned. I hopped in the car and headed to the finish area at Auburn Dam overlook. But the race website's written instructions told me to go left, and Google Maps told me to go right. I went right, but then second-guessed enough to do a U-turn right in the middle of downtown. Google's directions had been a little odd the previous two days in the Bay Area, so I was suspicious. But as I drove down the road in the dark, I zoomed out on the map and saw that I was indeed headed away from the park. I flipped a second U-turn on the narrow canyon road and headed back, now pressed for time and muttering under my breath about how Google had better be right. While it was only about five minutes, it seemed to take half an hour, and I zoomed into the parking lot, sped around toward the waiting bus, threw the car into what seemed like an okay spot (Will this be shady in the evening? I thought for a split second before reality dictated that I didn't have time to care), grabbed my stuff, and launched myself at the bus. It was 4:46am, and I was the last person on. "Just in time," said a man with a clipboard. "Don't I know it!" I replied, already sweating in the pre-dawn darkness. It was surreal to sit on a yellow school bus in the dark, surrounded by super-fit people outfitted in really nice running gear, everyone hushed and smelling fresh. Clearly not something that's meant to last long. I had made coffee in my hotel room and only had a chance to take two sips; not being used to caffeine, I was now flying pretty high. I used my excess energy to post on Facebook too many times. The bus dropped us off at a coffee shop, which was opening early for us at 5:30am. I sat around re-tying my shoes until it opened, then ordered a coffee and got quite a thrill when Ann Trason walked in looking relaxed and happy, chatting to a few people inside. The pre-race briefing started, and I joined the crowd outside in the dark. It was difficult to hear, and I was pushing up toward the front when someone tapped my shoulder and said my name. I was surprised to see John, handing me food for my pack. As I started stumbling out a "What the-" he explained that Ann was waiting in the portapotty line. I went to join her. There were still a few people in front of us when the countdown began. Those people gave up and went to the starting line, and we rushed into the toilets. We were running towards the crowd when the "start!" came, so we dashed to the side and around into the back of the surging mass of people. Thankfully the race wasn't chipped, because we never did really go over the start line! And then we were off in the dark, following giddy runners down the road. I was surprised to be on road for so long, but happy that the even surface and quickly brightening sky meant that I only used a headlamp for mere minutes. 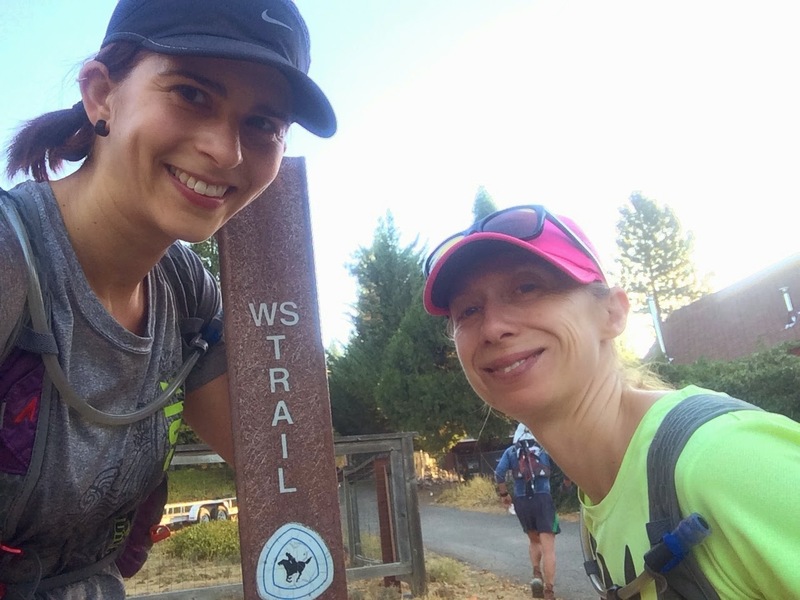 We hit Michigan Bluff aid station (6.3 mi) before I was ready, but it meant that we saw our first "Western States Trail" sign and we were thrilled to turn onto it. 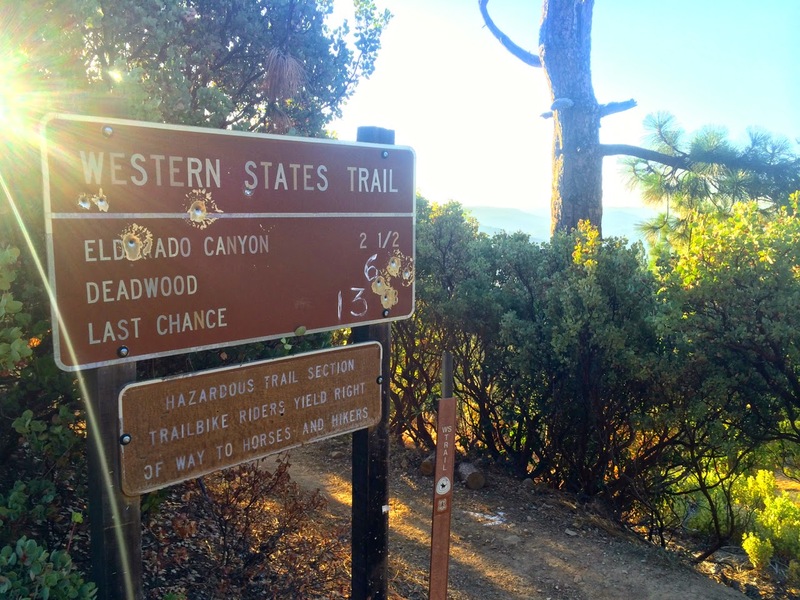 The trail was dry, heaped with fine, dusty dirt over medium-sized rocks, and headed straight down into the canyons. I enjoyed this section cautiously, trying not to think about the return climb since this was a loop back to Michigan Bluff. 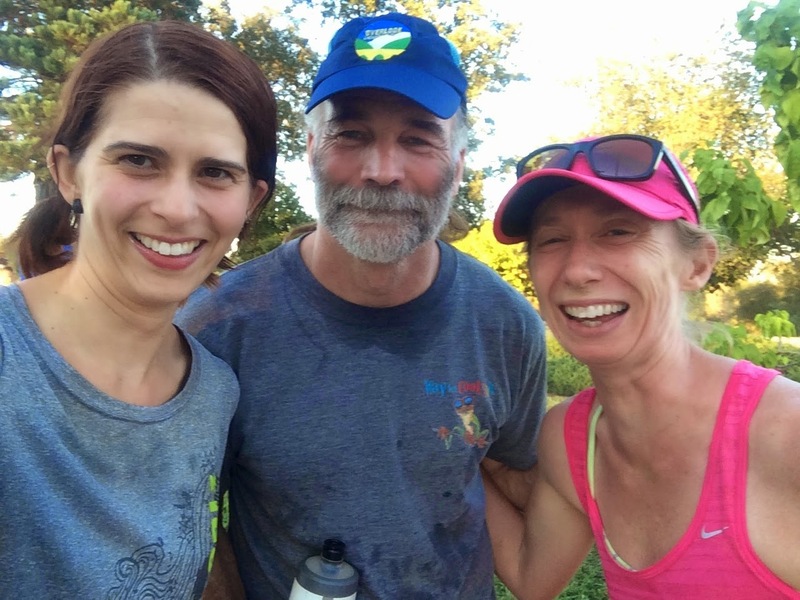 We basked in the dappled shade of the yellowing trees, chatting with other runners as the field stretched out into its natural order of paces. At one point we helped a guy who went the wrong way; there were arrows at trail crossings where the route looped back and crossed like a pretzel, rather than just turning around on the exact same trail, which can be boring, crowded and hell on the condition of the trail itself. That made the return climb much nicer than I thought it would be, and much of it was run (or "run")-able. 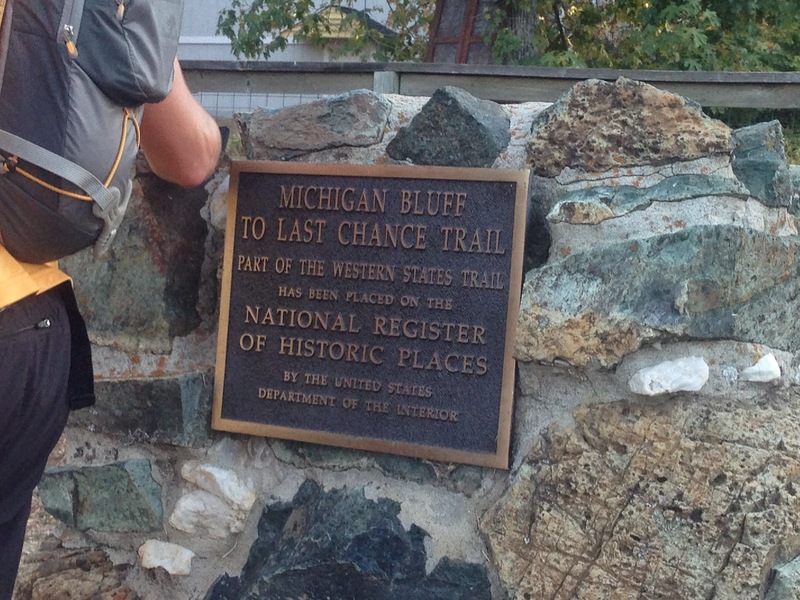 When we arrived back at Michigan Bluff (mile 13.2), I was ready for it. The thick, juicy watermelon slices were a treat. I also got to chat with a woman who-- I had overheard in the coffeeshop at the start-- won her age group at UTMB. Talk about a badass! We continued chatting with each other and everyone around us, back up and down the combination of roads and trails to the Foresthill aid station (mile 19.5), where the start line had been.Everything was going swimmingly, and the big climbs were all behind us. It was just starting to get really hot, but we were feeling good physically and mentally, and optimistic about the race ahead of us. We took some extra time at this aid station, and I enjoyed talking with a few people who were changing their shoes (already!) about shoe makes and models as well as other gear. There's no better place to get some good recommendations. 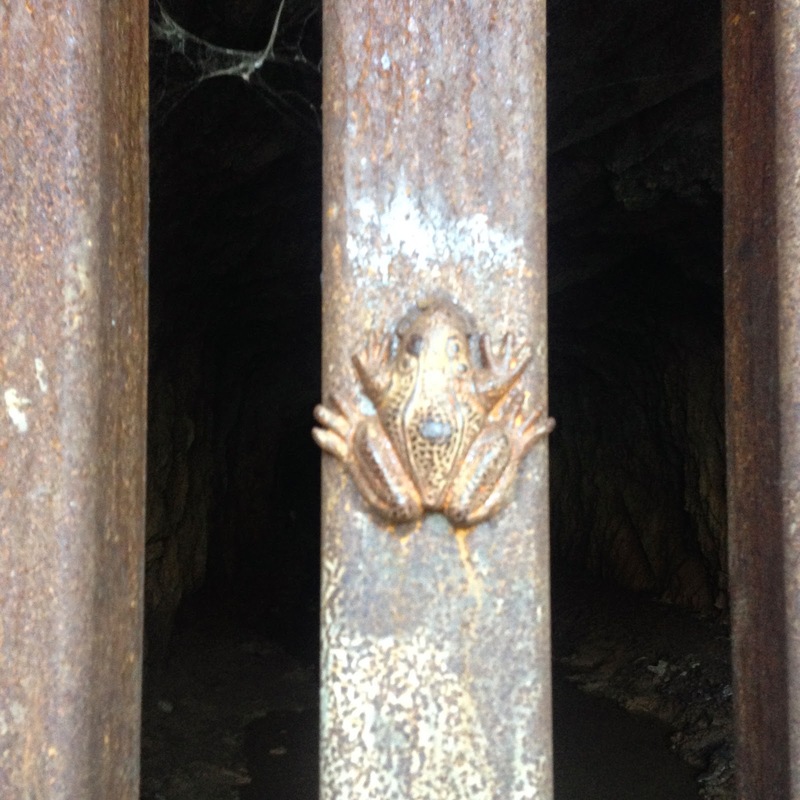 One man I chatted with seemed to have a strange skin disorder, with the lowest part of his leg pale up the ankle, then speckled with increasing density up to the knee in a rusty tan before fading to the same color as the rest of his body. I wondered what sort of rash or injury caused such a thing, until I noticed with shock that I had the same awful rash! Reaching down to touch it, first red dust and then pale, yellowy dust came away under my fingernails. Phew! I had forgotten about the different colors of dusty trails we had traversed. We set off again, excited to get back to the Western States Trail and to be done with pavement. The section from Foresthill to Peachstone (mile 28.2) was the longest between aid stations, and I soon began to suffer. It was so hot and dry that the canyons seemed to be exhaling like an opened oven. Instead of trees, the plants lining the trail seemed to be mostly crispy, yellowed shrubs that had long ago given up on making it through the summer alive. My mind began to panic and think about escapes. What would happen if I decided to quit? What would I have to do once I told the aid station workers? I knew it wasn't just a quick walk back to the start or an easy car ride from a volunteer to my car at the finish. 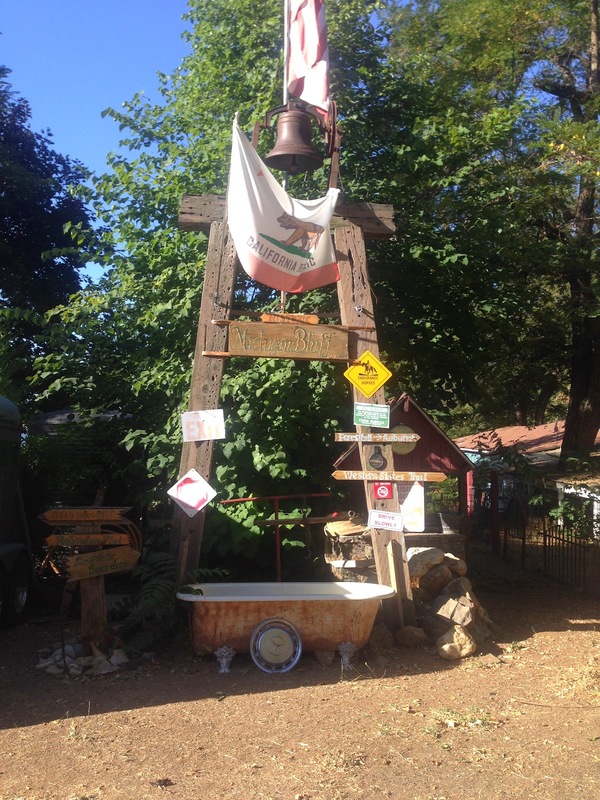 It could mean hours of hanging out at the aid station. Relentless forward motion was the obvious choice. I kept my mouth shut and kept going, thankful for all of those horrific stair and hill repeats that Willie-- who coached us every other week for three months leading up to the race-- put us through (I can't say enough about the value of mental toughness training; throw in an expert to answer your questions and even twice-a-month coaching is worth the investment). Meanwhile, Ann kept trucking along, seemingly oblivious to the heat. She floated up the short, steep hills while I baked in my own skin and drowned in dust. Then, on a precipitous, rocky decent, she suddenly said "The heat doesn't even seem to be affecting you." I laughed, because we were going downhill-- my specialty-- and I kept stopping for her to catch up. But on every uphill I had been thinking the same thing about Ann. It was such a relief to discuss, and we loosened up a bit as we kept wondering aloud, Where the hell is that aid station? Then after what seemed like hours and hours, we heard voices, and there it was-- a revelation in the forest. The Peachtree volunteers welcomed us with ice-cold cans of Coke (I drank a whole one), gave us each a rationed scoop of ice in our hydration packs, and encouraged us to eat more and more. They told us how many people had already come through, and we seemed to be right in the middle of the pack-- great news after the slog we had just endured. One man in particular joked with us and kept asking if we needed anything else. I poked fun at the shorts he was wearing: he obviously planned to run the course after his volunteer gig. He said something about seeing us in a little bit. I replied that I had no doubt he would catch up to us. Probably in his 50s, he had a typical wiry runner's build and looked fast. He was joking with the other volunteers, and I swear I heard a woman call him Brian. 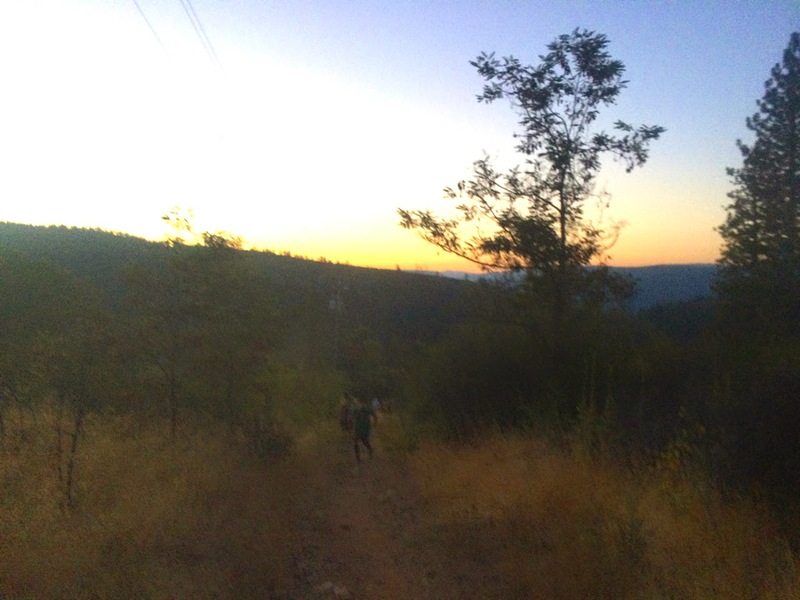 After the shaded copse and shared laughter of the aid station, the trail quickly got brutal. No shade, running along the exposed side of a steep hill, waves of heat hitting from the sun on our left and then radiating back from the beaten hillside on our right, dust and rocks and oven-dry air. It seemed like an eternity, a couple of hours at least, but our comedian-volunteer caught up to us. As we chatted and told stories, his presence infused us with new energy. 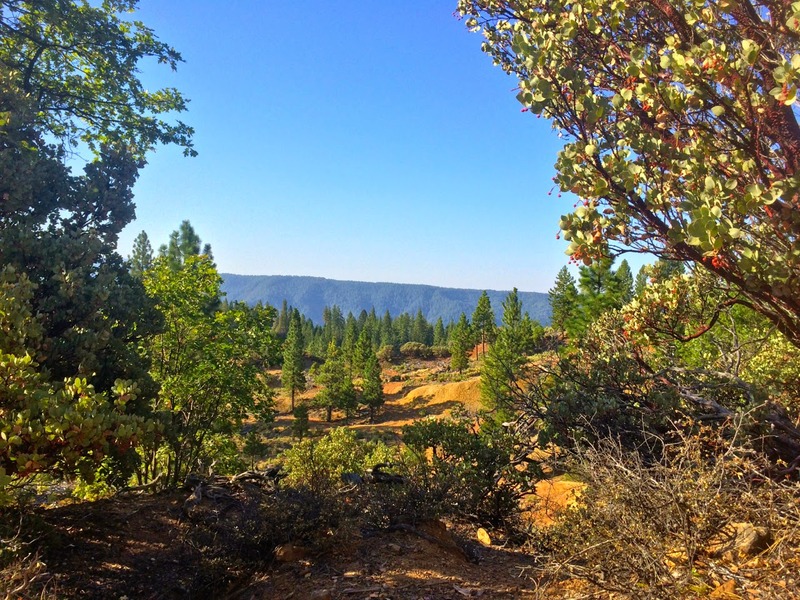 He told us about the trail, the surrounding area, and local races, and urged us on even as I began to slow to a walk with a vague feeling of nausea. That's when he asked if I had been drinking and eating. I hadn't, really. My stomach felt unsettled and it was just so hot. He dug some Tums out of his pocket and insisted I eat them. As gross as those things can be, they were like the finest candy melting in my mouth. They worked almost instantly, and I vowed to eat some at every aid station. Hell, I didn't even know they were available at aid stations before the man we now refer to as our "trail angel" told me. But he was just starting to bestow kindness upon us. Ann was eager to get to the next aid station, Rucky Chucky (mile 35.5) where our sole drop bag and cut-off time would be. She and our personal volunteer jogged ahead while I dragged on. I remember a particular section-- wide and sun-bleached, more of a fire road-- where I started passing people who were worse off than me. Some even sat on the side, in what little partial patches of shade they could find, and two were napping. Napping! This was my first official 50 mile race (Tarawera was shortened because of the cyclone, and Three Sisters wasn't a race) and I had never seen people sleep on the trail before. I didn't expect it at this mileage. Of course I hadn't really anticipated just how intense the heat would be, either. The pricklings of goosebumps on my forearms I had been able to ignore earlier became more insistent, and the words "heat stroke" kept playing in my head. Still, I knew I would get to Rucky Chucky and then it was only 15 miles to the finish. I never doubted that I would make it. It was just a question of how bad it would get. We were so high above the river, I wondered how we would ever get down to the crossing. 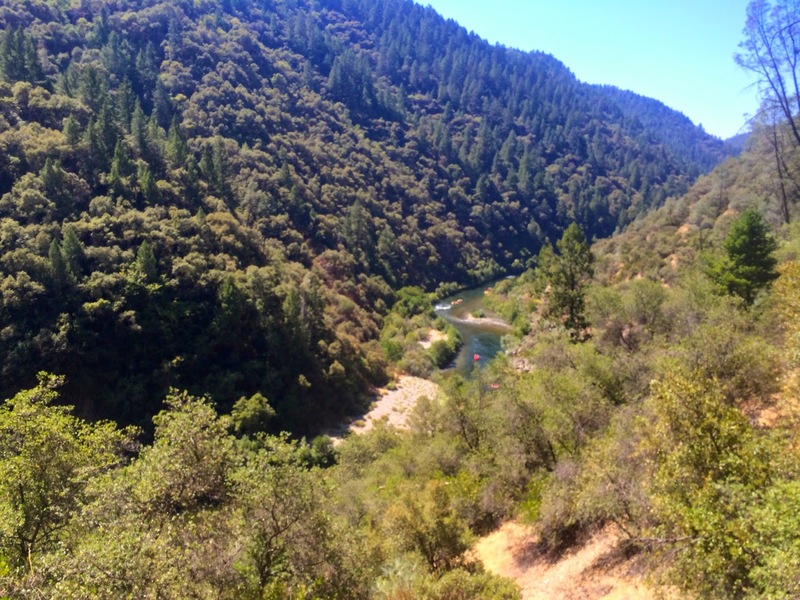 I ran with an old-timer for a while, and when all I could talk about was getting to the river crossing to cool off, he told me about an upcoming spot where you could bushwhack about 500 ft to take a quick dip. He kept thinking he saw the place, and then when we got there it wasn't right. But the idea of cool, flowing water... that kept me going. One person splayed at the side of the trail was a Japanese man who Ann & I had seen at the beginning of the race. He had an Elmo doll attached to his backpack and ran with a camera on a stick, so that he could video himself and different views of the race. He would push ahead, only to fall behind while taking video. He had been ahead of me for a while, but when the old-timer and I came upon him he had just sat and rested for 10 minutes. He was more or less limping, but my old timer knew him and encouraged him along. We ran together for a while, talking about races and where we've run. An encounter like that is sometimes instantly intimate, because you're so raw at that stage. It felt like he really let me into his life, and, humbled, all the foolhardy annoyance I had felt at the beginning of the race fell away. By then we were down near the river's level, I had run on ahead, solo again. I came upon two old-timers running together. They entertained me with stories of trail/ultra-running back in the day, and told me their trail names. One was Captain (his name was Kirk), but I don't remember the other one. Where we ran together was flat, grassy single track, and I think the improved terrain, proximity to the aid station, and their stories perked me up. Slowly, I edged ahead of them and then suddenly, around a dusty bend, was the aid station. And there was Ann and our trail angel! Ann grabbed me everything I could ask for. I sat down in a chair, and she told me the story of waiting there and hearing about the looming cut-off time, which was then extended because of the heat and everyone's slower-than-expected times. I changed my shoes, ate some Tums and potato chips, drank a Coke and got some ice. 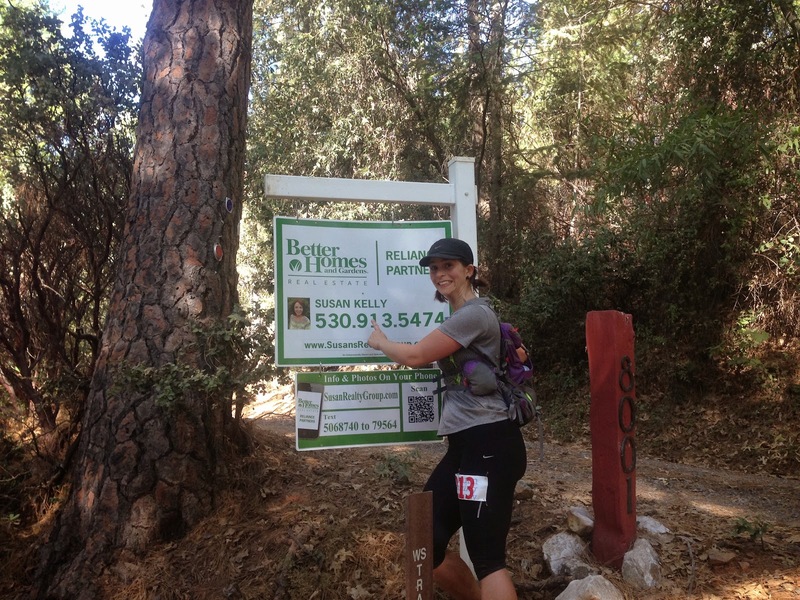 Then we were off, only a few miles to the river crossing at Poverty Bar (mile 38.7). It was a long three miles, but we got to the river, and a volunteer there asked us if we had any electronics. What a strange question, I thought, until he suggested we might have phones and I realized that yes, I would like my phone ferried across rather than chance it in the river with me. We each handed over our cellphones to a guy in an inflatable canoe, as the first man directed us to get in the water and stay close to the bushes along the bank. We walked downstream about 50 feet, where a man in an all-over Grand Canyon print tshirt, Santa Claus-style beard, and beatific smile topped by a light pink visor clipped me into a wire that was strung across the river. I was so thankful at how he cared for me, I was in awe to realize that it was Gordy Ansleigh, the guy who started Western States 100 and the whole 100 mile running craze! The wire and clip seemed overkill until I stepped out into the current. Four men stood out in the river, strung out along the line. And I needed their help! The water was up over my hips, almost waist height, fast-moving and deliciously cool. It was slow and tough going-- almost like doing push-ups the whole way across as I struggled to keep my body upright with my arms rigid against the wire-- but it was such a treat to not feel too hot for a little while. Once we got across, I lay down in the shallows to drench my whole body. It felt amazing. At least until Ann came over and asked if I still had John's headlamp in my pack, which was on my back and underwater. Oops! That and all of my food-- sandwiches, dried fruit, a brownie-- were drenched, which didn't matter in the end because I never felt like eating it, anyway. Our trail angel ran a bit ahead, and Ann & I walked along between round, medium-sized rocks that made it impossible to really run. This uneven, rocky terrain made my left knee ache, which is my common IT band flare-up. I wasn't too worried, though. 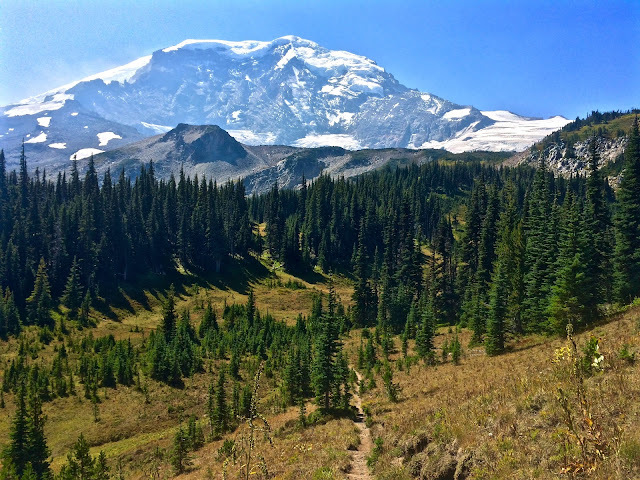 I knew the trail would change soon, and we had a shorter distance to the next aid station. The trail turned into a dirt road leading up from the river valley floor. We plodded along together, telling stories. Throughout all of the joking and teasing, our de facto pacer successfully evaded our attempts to learn his name. Of course, by this stage of run we were pretty distractible. 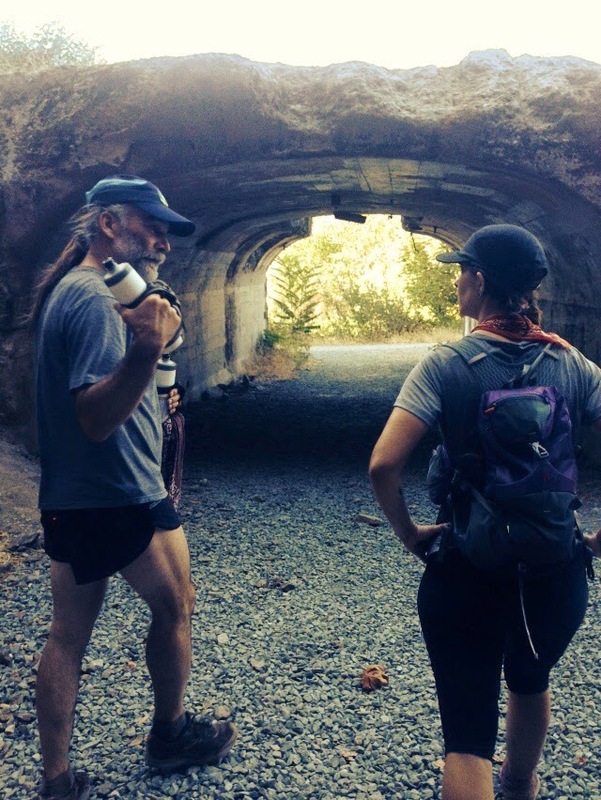 He pointed out places where he had seen bears and other wildlife, where he and friends had recently done some brutal hill repeats, and other tales. We got to the Brown's Bar- Quarry Rd aid station (mile 42.8) feeling pretty good. It was run by a group of women with cool "Dirt Diva" tshirts, and they treated us very well-- telling us how good we looked (my favorite lie late in a race), filling our packs with ice, making us "ice burritos" with our bandannas (our trail angel gave me his extra), even dumping ice down the middle of our sports bras (which became my new favorite thing ever). 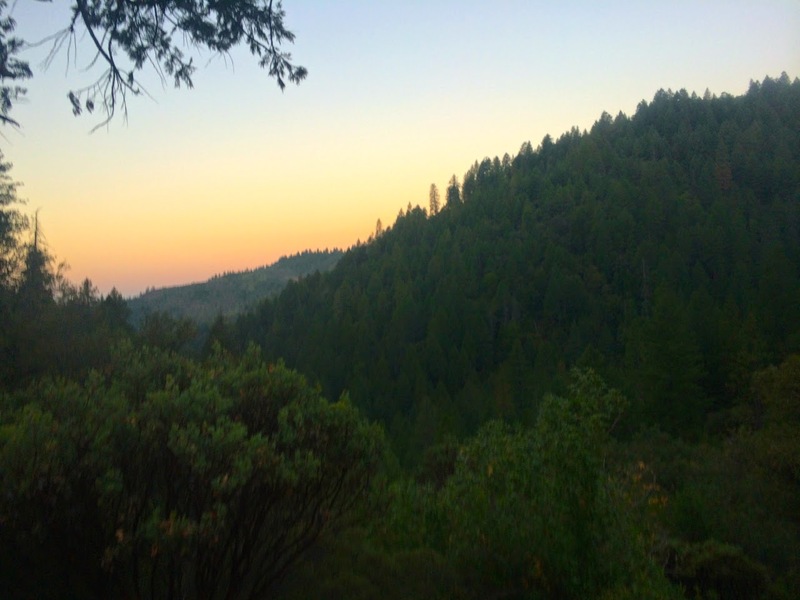 And the sun was finally beginning to recede, leaving us often in the shadows of the hills. We had less than 10 miles to go! 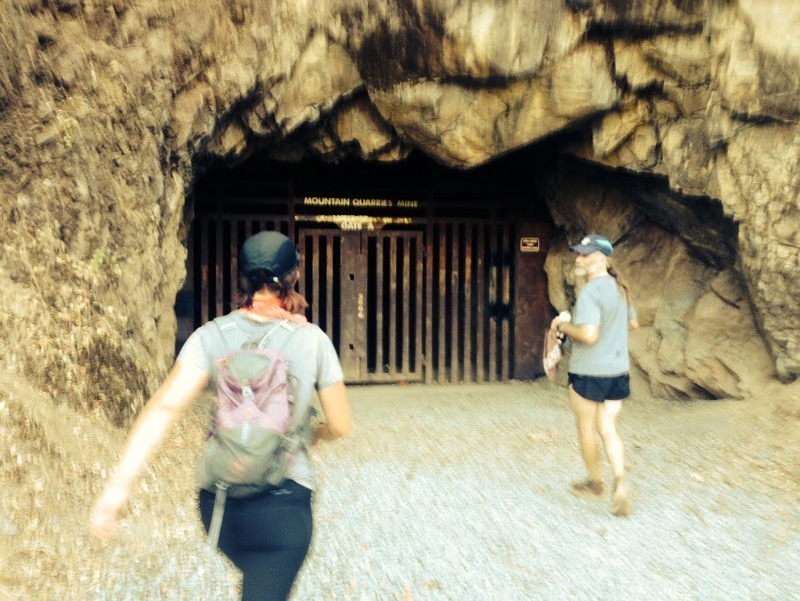 As we ran along the gravelly dirt road, perched above the river, our trail angel took us on a quick detour to the mouth of a cave that had been gated. He told us about the people who snuck in, and how fun it had been, long ago, to explore it himself. The stories and the cool air exhaling from the cave imbued this section of the race with a sense of nostalgia and wonder. 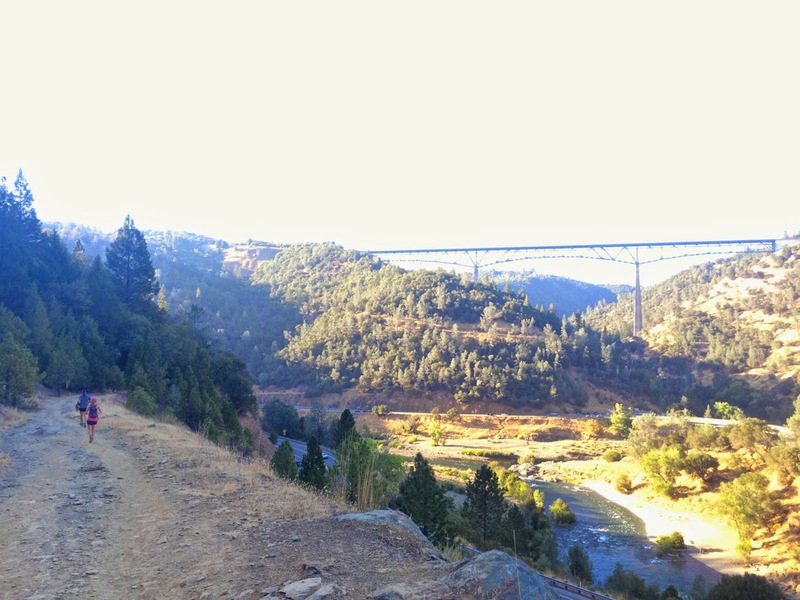 "No Hands" Bridge (the highest bridge in California and the third highest in the US, as the hotel receptionist had proudly informed me the night before) was visible in the distance, slowly looming larger. 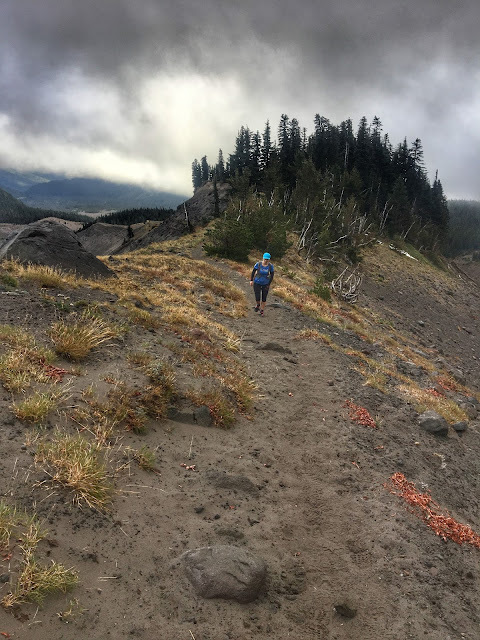 I couldn't believe how suddenly we were there, at the aid station (mile 46.7) on its near edge, a single small tent with just a few volunteers and a couple of other runners milling around. As we ran up, one of the volunteers, a big burly man, yelled "You're four, five and six for women! Time to get going." I couldn't really process this statement. One woman was just leaving the aid station with her pacer, and another one had arrived not long before us. "You can do this," enthused our trail angel. "You can place. Let's go!" I downed a paper cup or two of Coke and grabbed a boiled potato. I was ready, but Ann seemed oddly calm and unhurried-- especially given her usual competitiveness. She ate, retied her shoes, maybe topped off her water, while I buzzed to get going. Then we were off. 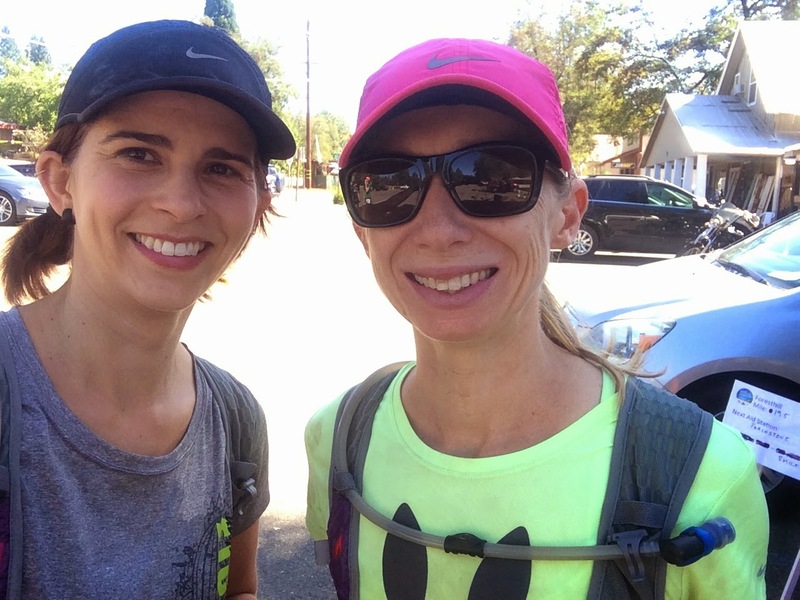 Our now-pacer laid out a plan: We would push hard to pass the woman who had left just ahead of us, then slow down when we were just out of sight to recover. Repeat with the woman who had left the aid station as we arrived, and they would both be so discouraged by our strong showing in the final miles of the race that they wouldn't bother to try to catch us. He wheedled and cajoled, telling us how strong we looked, while they were obviously hurting. Typical pacer talk. Hey, it really works! We zipped past the first woman, held it for maybe 100 yards til we rounded a corner, then slowed down. I knew we only had four miles to go, and that it would all be uphill. But I couldn't run any. So every flat and slight down, I pushed. Our trail angel would describe the hill "just around the corner" or in "150 yards" that I could walk at. We caught up to the woman who left the final aid station just as we arrived, and passed her with another strong showing. It drained me. Ann was feeling good, with all those little uphills calling her name, and she took off. I was thankful that our pacer stayed with me. I needed it. He kept up the wheedling, praise, competitive stoking, and especially the "just around the corner" talk. He got me to pass a handful more people, who I think were 100k runners. Then we crested a hill, crossing a road and passing a gate where a tired volunteer sat to direct runners. "Just up the hill!" she said. I couldn't believe it. We had to leave the trail and cut up the side of a big, grassy hill-- the kind that's too steep for rolling down, unless you're a real daredevil. "Push, push!" yelled our trail angel, "The finish chute is right there-- you can see it." He veered off to the side, and I gave it all I had. 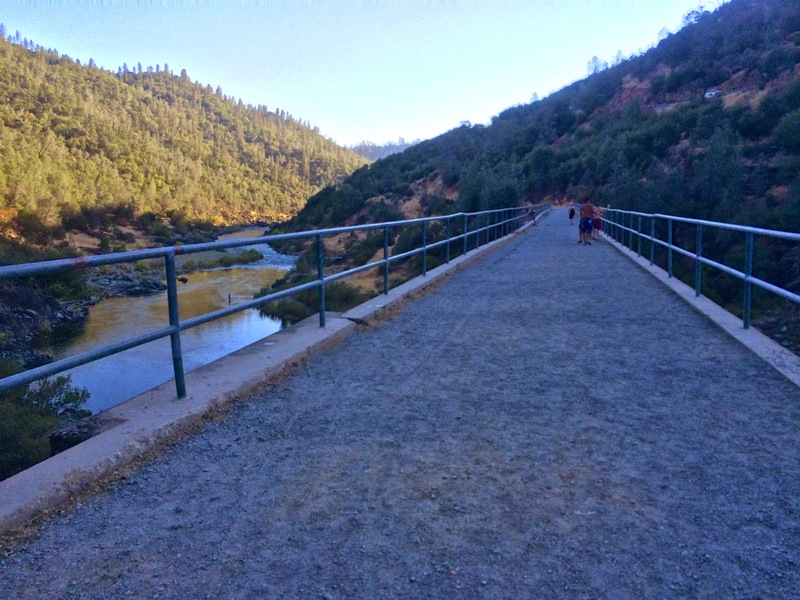 I had never seen a finish chute on an incline like that (Auburn Dam Overlook, mile 50.7) and while tough, it was still a welcome end. 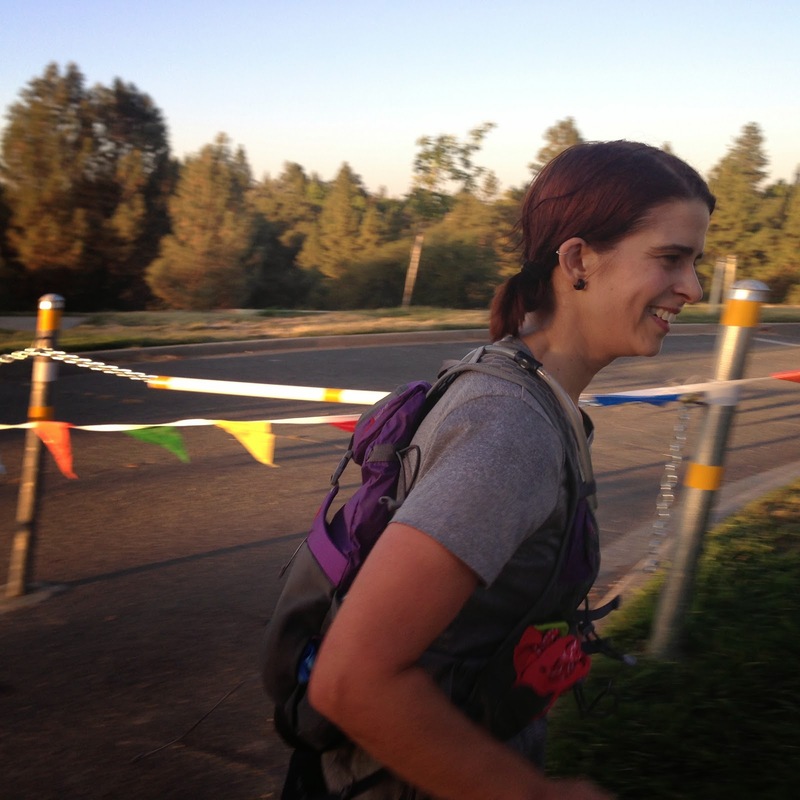 I passed a 100k woman walking the last few flag-lined yards, and then I saw Ann smiling and cheering me on. I crossed the line to Ann Trason and her two dogs. She hugged me and asked how I felt. Suddenly, I couldn't catch my breath. I gasped and couldn't get air. Although I've never had asthma in my life, it was how I imagined the feeling. Ann Trason got me to a chair, and Ann came over to take care of me. The painful squeeze of my chest slowly subsided and I realized that it was my infamous crying spell upon finishing that made a lump in my throat I couldn't breathe around-- my body was too dehydrated for actual tears. 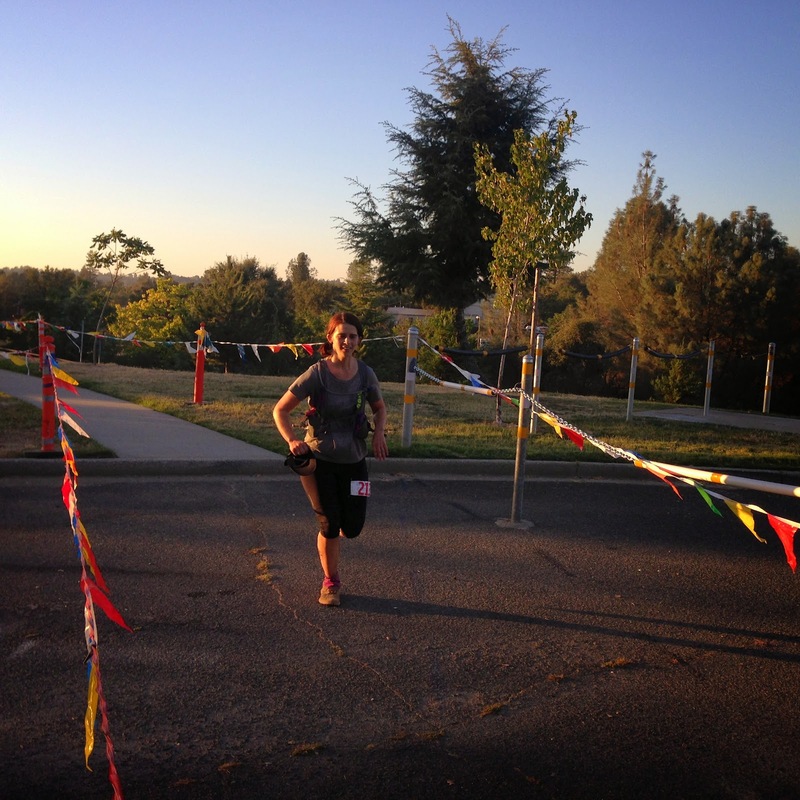 I had come in 4th woman for the 50 mile, and Ann came in 3rd. She wasn't far behind the first two, and even won a prize. We learned that many people had dropped out, overcome by the heat. Our trail angel appeared and we chatted with him a bit, overcoming his resistance to taking a photo of the three of us. We knew there was a big barbecue with food, but it just didn't sound appetizing to us. We got our finisher's tshirts, jackets, and most importantly, the pint glass, and got in our cars. Ann & John drove back to the house they had rented, to leave in the morning and drive all the way home to Portland. My drive back to Oakland only took two hours, where I took a long, hot shower and was way too jazzed by the whole day to really sleep. My family left in the morning to fly home. We never-- despite social media and googling-- found out the name of our favorite volunteer, makeshift pacer, and trail angel. He's the only one we've ever had, and now I clearly see the merit. Sir, if you are reading this-- thank you eternally! I am so grateful for the miles, jokes, and your bandanna you shared with me. It is now a treasured part of my running kit. Even if I could've done it without you, it wouldn't have been half as enjoyable. And then we went for a run on Monday. But that's another story.